We recently shifted to Genesis WordPress framework. To help you decide here I am presenting a comparison between top contestants as Genesis vs. Thesis. If you’re a professional blogger who is serious about his blogging business, I am sure you know the importance of having a cutting-edge website. WordPress platform and a good WordPress framework can provide you such a website or blog. A couple of days ago TechWelkin was upgraded from the basic WordPress installation to the Genesis Framework. So far, I was using TwentyTwelve theme that comes along with WordPress. I had customized it heavily to meet my needs. Genesis, I believe, will certainly help my rapidly growing website. In past few years, there has been a lot of debate over the best WordPress framework. The top contestants for the entitlement of superlative have long been Thesis and Genesis. But such a comparison is history now. I did a long research, read hundreds of articles and spent significant amount of time in thinking over pros and cons of Thesis and Genesis frameworks before coming to a final decision and implementation. To make things easier for you, here I will talk about a few reasons as to why I chose Genesis over Thesis. Here we go, Genesis vs. Thesis. For established WordPress bloggers and companies, price tag may not be an important issue. But for relatively smaller websites, who are still testing the waters, investment in a paid service could pinch a bit. At around $60, Genesis is far less expensive than Thesis, which comes with a price tag of $87. Thesis offers only 12 months of framework support through its user forum. In comparison, Genesis comes with lifetime support. Longer duration of support is very important, especially for users who are not very tech-savvy. These users will need to ask questions while setting up and modifying the framework they select. It is true that after 12 months, one may not need support every now and then because even a novice user would have learned the tricks during this period. But lifetime support from Genesis will turn out to be of great significance when you’ll read the next section. Genesis provides unlimited life-long updates after you purchase the framework. Thesis, on the other hand, will upgrade your installation of framework only for one year after the purchase is made. This means, unlike Genesis, Thesis will leave you out there in cold if you do not pay again for upgrade. Such a condition will hurt even more if there would be no upgrade during your eligibility period of 365 days –and bang on 366th day a major upgrade of Thesis will appear on horizon! Once bought, you can legally use Genesis on any number of domains. 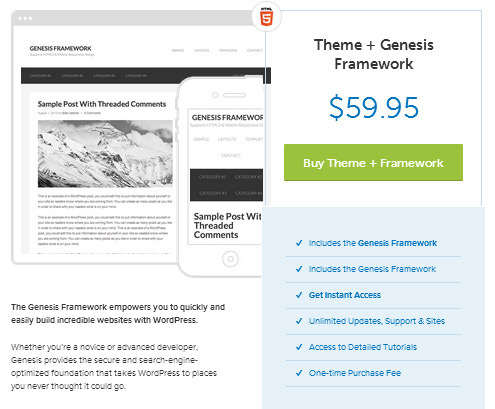 You are even allowed to develop websites based on your copy of Genesis and sell these websites to your clients! DIY, the developer of Thesis, however, binds your $87 copy of framework to just one domain. 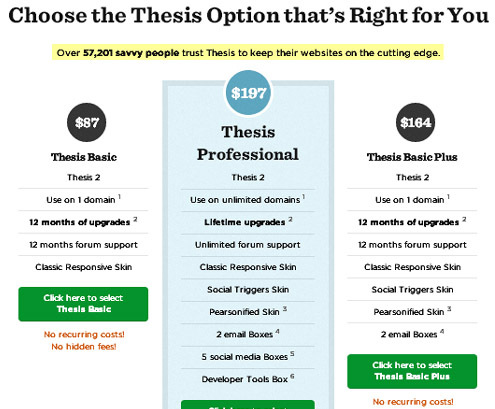 If you have, let’s say, ten WordPress websites for which you want the framework, you’ll have to buy $197 version of Thesis (this version comes with unlimited support, upgrade and domains). I can not really comment on how good or bad was the 2.0 version of Thesis because I never used it. What I am reporting here is based on the opinions of a few other tech bloggers. Version 2.0 was released in 2012. Initially it was lauded by users but soon they realized that this version had a number of loopholes. Many users removed this upgrade soon after installing it. Version 2.0 apparently caused great damage to the image of Thesis and helped even the most ardent supporters to look for alternatives. Matt Cutts also shifted from Thesis to Genesis in June this year. Darren Rowse, Matt Mullenweg, Cali Lewis –they all began to use and support Genesis. Although I knew beforehand how Genesis looks and works –but honestly, when I installed it –for a moment, I also felt that paying for Genesis was not worth it! You don’t see any big changes in your WordPress admin dashboard. After reading and hearing so much of praise in support and need of a framework, one begins to expect that installing a framework will make (and look) things ultra-easy. Genesis does indeed makes things ultra-easy but it does not hijack appearance of WordPress. It simply adds an option “Genesis” to the dashboard sidebar. Thesis, on the other hand, makes a lot of changes in admin dashboard. It visually presents you with a barrage of options. But nevertheless, Genesis again scores over Thesis because of well written documentation, tutorials and code snippets that become available to you from the website of StudioPress. While some people might like visual appeal of Thesis –Genesis folks chose to keep it neat and help users in a systematic way. This is true; however, again from the viewpoint of a first-time user of a framework –I kind of feel that Genesis should make its power available for non-developrs rather easily. I suggest that they merge their Genesis Simple Hooks plug-in with the framework itself OR at least tell newbie users that such a plug-in is available which can be of use for a non-developer user. I hope that this review will help you in making up your mind in case you are planning to go for a WordPress framework. Let me know your thoughts on the framework that you are already using or planning to buy. Please feel free to ask if you have any questions on this topic. I will be happy to try and help. Thank you for using TechWelkin! I feel if chosen between the two, one should go for Genesis because of its flexibility and robust set of features. Thesis on the other hand had a major downfall after its 2.0 version loopholes and controversy but some people are happy with it. If you want to try another framework go for templatetoaster or cherry framework. They work great as well. Do not stick around just a particular one. Explore others, what if you find more exciting features.